In any painting project, investing in the right paint and tools will get you the most professional results, and painting window trim is no exception. The payoff will be well worth the extra care and (usually) slight expense. After all, clean, crisp window trim can really make or break the look of a room—or of your home's whole exterior. Whether you have just installed a new window or you’re updating your home’s colors, indoors or out, your project will most likely involve painting window trim. After all, how better to accentuate the new look than with crisp lines and fresh color? Painting the molding around the windows doesn’t have to be a difficult chore. As with most paint jobs, getting a professional look—without making a mess—starts with the right tools and techniques. With a little help from the pros and high-quality products from Hyde Tools and Richard Tools, you can have great-looking window trim in no time. For both interior and exterior trim, you’ll probably want to choose a paint with a glossy finish. These paints form a durable finish that repels dirt and grime better than flat paint, and they’re easier to wipe clean, too. The specific type of paint needed, however, depends on your trim’s material. Window trim can be made from wood, vinyl, aluminum, or steel, and there’s no single coating that works with all. If you start with just any old can of paint, you could risk seeing the results of all your hard work flake off within the year. Choosing a paint that’s compatible with your type of trim will help achieve results that last. Wood is the most common material used to trim both interior and exterior windows, and you won’t have any problem finding a good-quality paint. For exterior wood trim, choose a premium exterior gloss paint, either oil or acrylic. For interior wood trim, choose a high-quality latex gloss paint. Medium-Density Fiberboard (MDF) is becoming a popular material for interior window trim because it’s easy to install and resists moisture damage. The same paint used on interior wood (high-quality latex gloss paint) can be used on MDF trim. Vinyl is usually reserved for the exterior of a house and paired with vinyl siding. Its impermeable surface won’t hold standard paint; those suggested above would eventually peel off. Instead, look for an exterior gloss paint specifically made for vinyl. Metal trim is also typically found on a home’s exterior and paired with metal siding. Choose an exterior gloss paint labeled for use on metal. Some of the best metal paints contain rust-resistant chemicals that will help prevent rust from forming on your trim. If your window trim is unfinished, you’ll get the best paint adhesion if you apply primer before painting. Like the paint you choose, the primer should be compatible with the type of trim you’re painting. If you’re painting interior window trim, just about any time is the right time to start this paint job. There’s less flexibility, however, for scheduling a paint job on exterior trim. Check the weather forecast and choose a day when the temperatures will stay between 50 and 80 degrees Fahrenheit. Hotter than that, and the paint can dry too quickly, which can affect the quality of the finish. You’ll also want to pick a day without rain or wind. No matter how careful you are, painting on a windy day will lead to unwanted spatter on your home’s siding. While many a do-it-yourselfer would like to get straight to the main event—the painting—the finished project will be only as good as your prep job. Be sure to take time to prepare the surface to accept the new paint. First, scrape away any peeling paint. 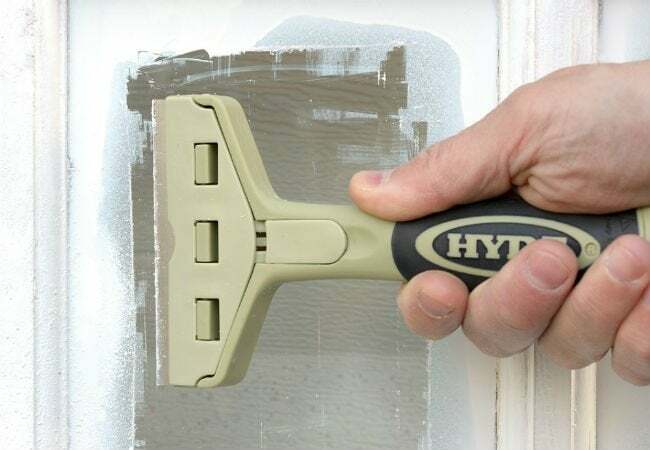 Go over the old window trim thoroughly with a paint scraper like Hyde Tools’ Black & Silver 6-in-1 Paint Scraper, because any remaining loose paint will cause the new paint to peel off. Of course, if you’re painting new or unfinished trim, you can skip this step—it’s only necessary for trim (of any type of material) that has peeling paint. Remove hardened caulking. On older windows, the semisolid sealant that fills the seams between trim boards will, over time, become brittle and pull away from the trim. (If you’ve just installed your window, you won’t have this trouble; skip ahead!) You can try scraping it out with the edge of the 6-in-1 paint scraper or a metal putty knife, but you’ll have better luck with the Caulk Aid from Hyde Tools. Made from high-impact plastic, this hand tool is designed so you can remove old caulk with one end and apply fresh caulk with the other. Start with the beveled blades to quickly shave away old caulking from the sides of a seam; the sharp point can dig stubborn caulking out of corners. • On interior wood and MDF, as well as vinyl trim, use a household degreasing cleaner. • On exterior wood, choose a cleaner that contains a mildewcide to protect the wood against potential mold and mildew growth from exposure to moisture. • On metal trim, work with a rust-removing cleanser. Always read the instructions before you apply; the packaging may recommend that you rinse the cleaner away. Sand trim smooth. No matter the type of trim, if it’s been painted once before, start with a 150-grit sandpaper to smooth away any edges where that old layer of paint flaked to reveal the bare surface. Then, switch to 220-grit sandpaper to fine-tune the surface. If you’re painting unfinished new trim, use only the 220-grit sandpaper to scuff the trim enough for the paint to adhere. Apply new caulk to the exposed seams. For caulking to efficiently seal the seams and gaps in window trim, it needs to be applied and smoothed into the crack. To achieve a professional-looking finish, run a bead of caulk in the seam (1/8 inch is usually sufficient) and then use the flexible padded tip on the Caulk Aid (on the end opposite its scraper) to smooth out the bead. The tool makes it simple: Start at one end of a seam and, with gentle pressure, pull the Caulk Aid to the other end. If caulk builds up under the padded tip, just wipe it clean on a rag and continue to the end of the seam. It’s time to paint! For unfinished trim, you’ll need to apply a coat of primer before the paint, using the following method for each application. For previously painted trim, you can start with your first coat of paint. Instead of taping off the trim to protect the wall, save some time without sacrificing clean lines by using the 11-½-inch Mini Guide™ Paint Shield & Smoothing Tool from Hyde Tools. Just press the paint shield’s stainless steel blade into the crease between the trim and wall as you brush on the paint to prevent splatter and smudges. After you’ve painted 11 inches or so of trim, lift the paint shield away and wipe its blade on a rag before repositioning it along the next section of window trim. For the best results on narrow strips of trim, opt for a small angled paintbrush like one from Richard Tools’ Mini Master Angular Touch Series instead of a flat paintbrush, which is more suitable for cutting in on large areas. Brushes in the Mini Master Series run from 1½ to 2½ inches in width—the perfect size for painting trim. Plus, this line is suitable for use with all types of paint, and the brushes’ soft-grip handles make them easy to hold. Apply one to two coats for a durable finish, making sure you wait the proper amount of time before applying the next coat. You can find the recommended drying times on the paint can. As you’re working, you may end up getting paint on the windowpanes. Don’t worry! We’ll show you how to remove overpaint from glass in the next section. After the final coat of paint dries completely, assess your work. Any overpaint or splatters seen on the windowpanes will detract from the appearance of the fresh coat, so you’ll want to clean those up. Luckily, even if dried, paint can easily be scraped from the glass with the right tools. Position the stainless steel blade of the Mini Guide Paint Shield along the edge of the window pane, where the glass meets the painted trim. Cut along the outer edge of the Mini Guide with the 9mm Snap-Off Blade Utility Knife. (Choosing a utility knife with snap-off blades ensures that you will always have a super-sharp blade to make the cleanest cut.) The cut line you make now will provide a clear, crisp, and straight line toward which you can scrape away the excess paint. 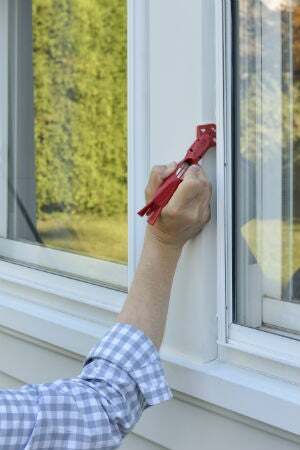 After you’ve made this target line, use a glass razor scraper like Hyde Tools’ Glass Scraper with 5 Blades Stored in Handle to remove the paint from the windowpane. Position the blade parallel to the edge of the trim and, using a straight motion, scrape the stuck-on paint right off the glass. The scraper features an ergonomic design to reduce hand fatigue when scraping and, as the name suggests, a ready supply of replacement blades in the handle in case you need to change one out on the job. With this trusty tool in hand, you’ll have sparkling clean glass without a trace of stray paint.